You’d head for the door — after pushing the picture hangers into his hand — right? Recently someone on Facebook posted about an interview they just did with a person I have heard about. I was interested. I clicked through to the site. There’s the video. I clicked on it and it started to play. 45 seconds in, the video stopped and displayed a notice saying that you must sign up as a paid member in order to see the rest of the interview. How can anyone think that this is a reasonable way to get members to sign up? I subscribe to a newsletter from a company called Mind Tools (not an affiliate link). They have a paid membership program, but they also send out weekly marketing emails with a twist I haven’t seen anywhere else. They show color-coded links to recent posts. 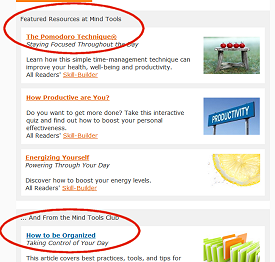 The first section, “Featured Resources at MindTools,” has linked titles in orange. These are free, and the first article is included in its entirety in the email itself. The second section, “From the Mind Tools Club,” has linked titles in blue. These are inside the members’ area. Easy. Elegant. Simple. You know at a glance what’s free and what isn’t. And you get a quick taste of the goodies inside the pay area. Brilliant marketing. Am I a member of MindTools? You bet. 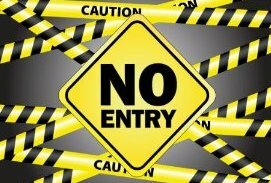 How can you adapt this idea to your marketing today?